“There was a lot of drama at school today,” North said as soon as they were through the door on Tuesday afternoon. “What kind of drama?” I asked. “A fistfight and a walkout,” they answered. Apparently a seventh grader pushed North and a friend of theirs out of the way as they walked to the locker room after gym class and it ended up getting physical between North’s friend and the girl who started it. North’s friend got a lunch detention and the other girl got three. North was named as a witness on an official form. 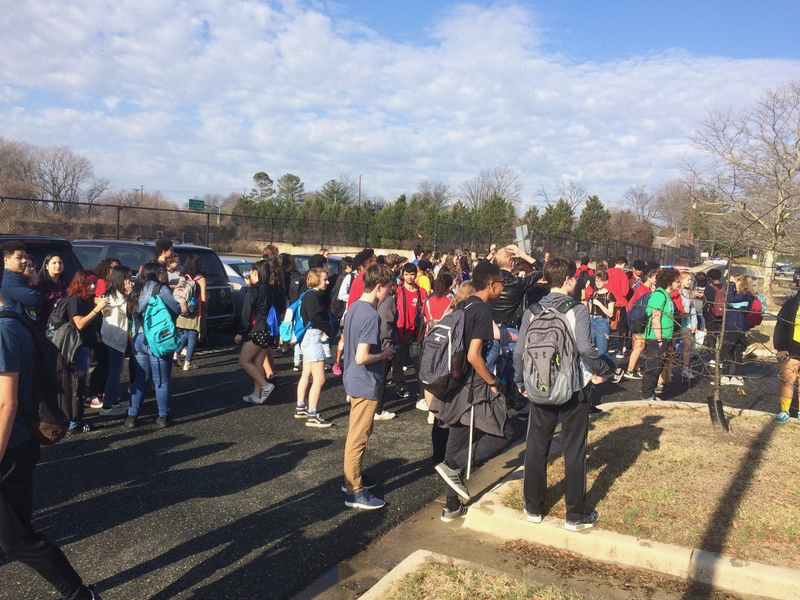 The other, more schoolwide drama was that there was an attempted walkout to protest gun violence. At first North said kids left campus and went to downtown Silver Spring, although they later amended their story to say they weren’t sure where they went, or if they even managed to leave the building. There were two kids who left North’s Spanish class, on the pretense of going to the bathroom and never returned, but neither of the escapees has a class with North later in the day so it wasn’t clear if those kids came back for their other classes. There was a robocall from the school that night explaining that some students had been planning to walk out and outlining some alternative forums the school had provided and would provide the next day during lunch and after school for students to air their views. The call went on to report that students at several local high schools were planning to walk out the following day to attend a rally on Capitol Hill and urged parents to tell their middle school students not to join that walkout. The odd thing about the call was that it never clarified the very thing North didn’t know—whether any kids successfully left the building. I say this is odd because in the past whenever there’s been a call about an incident at school it’s always been clear what happened. I had foreseen the possibility of a walkout at Noah’s school in response to the shooting at Marjory Stoneman Douglas High School and I’d already told him if there was one and if he took part he wouldn’t get in trouble at home. I hadn’t even thought to tell North the same thing (or something different). I guess I just didn’t expect it of middle schoolers. “You beat us!” Noah exclaimed at dinner when North was telling us about it. He was planning to participate in the walkout the following day and North wanted to as well. Beth and I considered it, because we want to encourage the kids to speak their minds and be politically active, and I think we might have said yes if North knew a big group of kids who were going and would promise to stick together, but they were unable to confirm that any of their friends were going and from their middle school to Capitol Hill is a longer trip on public transportation than they’ve ever made solo before. More important, there was the sometimes chaotic environment of a protest to consider. A month shy of twelve didn’t seem old enough to navigate it alone and I didn’t think they could necessarily find their brother in the crowd. As for Noah’s school, there was no warning call to parents and when the principal spoke about the walkout on the P.A. the day before it happened, she noted the school did not officially sanction it and then helpfully provided the time and destination of the protest. “She all but encouraged us to go,” Noah said. After the fact the school was retweeting a member of the County council praising Blair students for exercising their First Amendment rights. One of Noah’s teachers said anyone who didn’t go would have an alternate assignment, basically making going to the rally the default position. 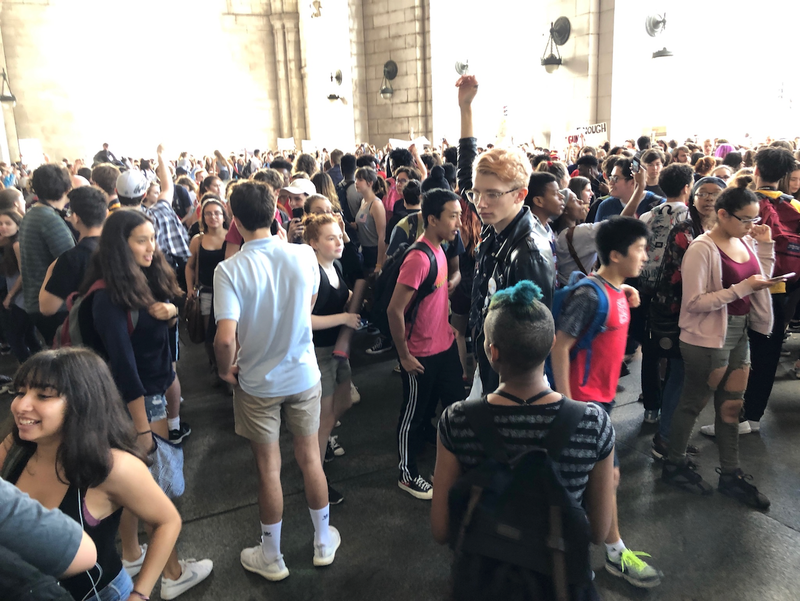 So Noah left for school Wednesday morning without even taking his binder, attended his AP biology class, and then between that class and the next one, walked out with hundreds of his classmates. Here’s a picture of them from an MSN tweet. Noah’s in the green t-shirt. 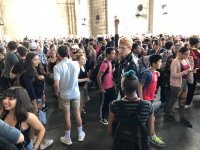 They walked to the Metro and rode into the city, where they rallied in front of the Capitol, listened to our Congressional representative Jamie Raskin and several students from different high schools speak. Back at home, I was watching coverage of it on Representative Raskin’s Facebook page on and off for hours. There were thirteen hundred students from several Montgomery County high schools there, according to the school district. 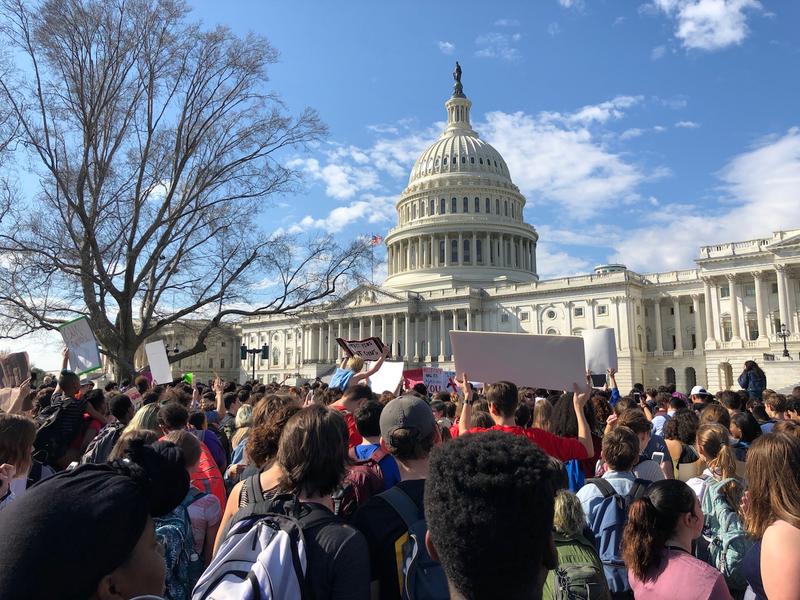 The students carried signs that said, “Is Our School Next?” and “My Life > Your Guns,” and they chanted, “Enough is enough,” “Our blood, your hands,” “Hey, hey, NRA. You can’t beat the PTA,” and “Hey, hey, NRA. How many kids did you kill today?” They were full of anger and hope and beauty and promise. It was all I could do not to cry, I was so proud of all of them. From the capitol, the students marched to the White House and around 1:30 or so, the rally broke up. Noah got himself some pizza and then dropped by Beth’s office, where he spent the rest of the afternoon, attending the retirement party of one of Beth’s colleagues and enduring hugs and exclamations about how big he’d gotten from people who hadn’t seen him since he was a little boy and liked to go to Beth’s office on snow days and school holidays. He came home a little sunburned on his nose and neck (it was a sunny day of record-breaking heat—82 degrees at National Airport) and saying he wanted to find Representative Raskin’s speech online, because he hadn’t been able to hear any of it. That’s so often true at protests. I didn’t hear a word of any of the speeches at the Women’s March last year. Back at school the next day he said his teachers were congratulating the kids and there was only one assignment Noah missed and would not be allowed to make up (in band), so the walkout was close to consequence-free for him. “The resisting authority part of it didn’t really work,” he joked. Even if it isn’t exactly braving fire hoses and police batons and dogs as children and adolescents did fifty-five years ago in Birmingham, young people all over the country are answering the call of their grieving and angry peers in Florida and because of their leadership just a week a half after the shootings some modest action on gun control seems at least possible. Republicans are talking about banning bump stocks, expanding background checks, and raising the minimum age for gun purchases. Companies are severing ties with the NRA left and right. It remains to be seen if any legislative change will actually happen, but even to be hearing these proposals taken seriously seems like a big deal. 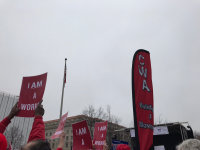 Three days after the student walkouts, on a damp, foggy morning, Beth and I took the Metro into the city and joined members of her and many other unions at a rally in Freedom Plaza in anticipation of arguments in the Janus vs. AFSCME case at the Supreme Court on Monday. 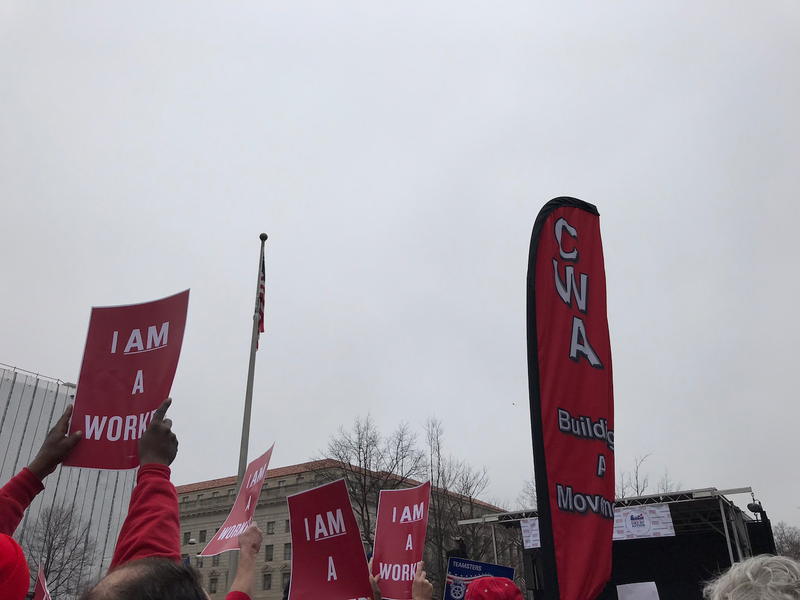 When we arrived someone was onstage singing “We Will Resist” to the tune of “I Will Survive.” There were speeches by union members and union leaders—including a rather fiery one by the President of CWA—and elected officials (Governor Tom Wolf of Pennsylvania, Governor Kate Brown of Oregon, and Delegate Eleanor Holmes Norton of the District of Columbia). Taking note of what’s on everyone’s mind these days, at least two people speaking in support of public sector unions noted that the teachers who were killed defending students at Parkland and Sandy Hook were union members. 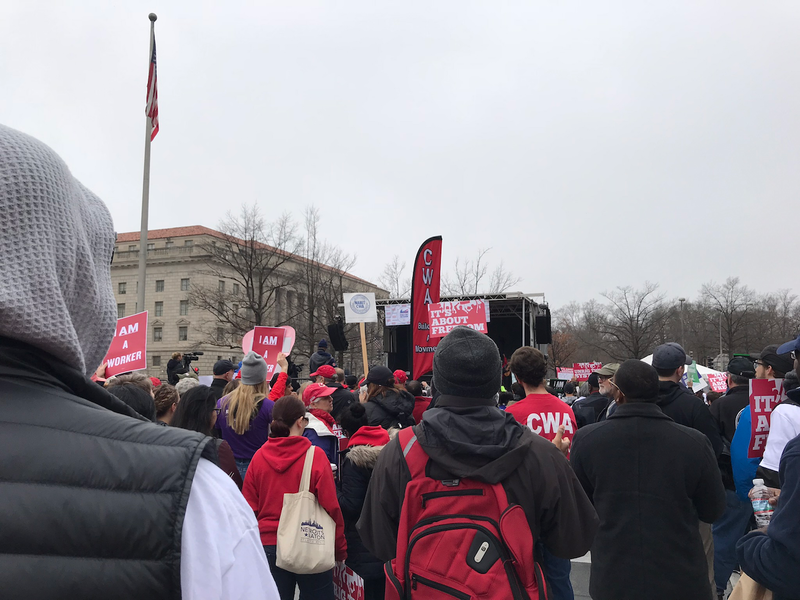 I can’t say I felt as much hope that something might change soon at this rally—in fact, a few of the speakers seemed to acknowledge that the case is likely to be decided the wrong way, largely because of Neil Gorsuch’s ill-gotten seat on the Supreme Court. But you never know what might happen. Supreme Court decisions do sometimes surprise and a couple weeks ago I would have said the gun control debate was settled when twenty first-graders and six brave teachers and school staff died at Sandy Hook and even that couldn’t move the needle. But even though I felt that way I kept writing checks for gun control and for much the same reason, I go to rallies for things that seem as if they might be lost causes… because you just never know. This entry was posted in Resistance, School by Steph. Bookmark the permalink.